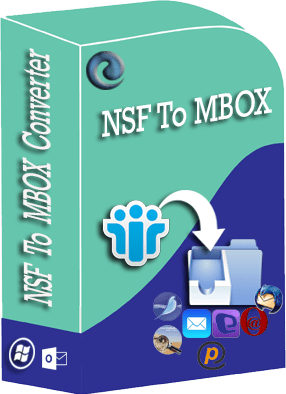 NSF to MBOX Converter tool is a simple solution used to convert Lotus Notes NSF emails in MBOX format. It supports batch conversion of Lotus Notes to MBOX format to open the MBOX file in various platforms like Eudora, Thunderbird, Apple Mail, Web Mail etc. Support selective data migration of Lotus Notes to MBOX format. After completion of NSF to MBOX conversion it preserve all inline images and metadata properties. The tool has a “Date Range” Option to export a specific time range data of Lotus Notes into MBOX format. Maintain the same folder hierarchy of IBM Notes file in the MBOX format after the conversion. 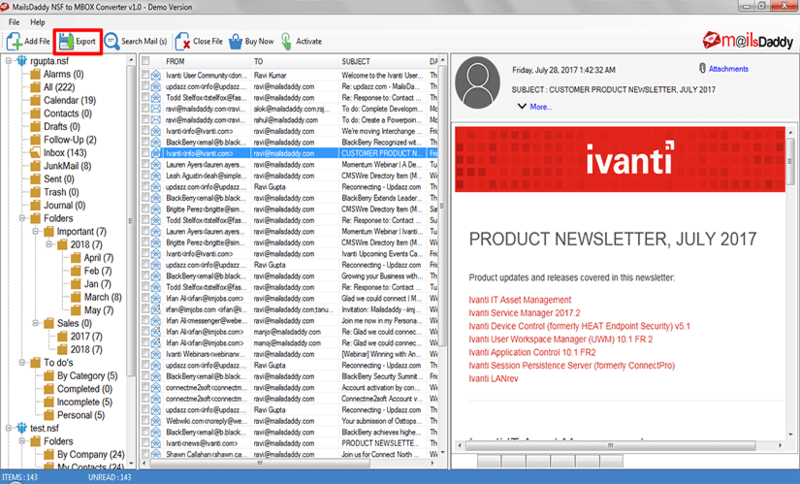 Migrate Lotus Notes emails in MBOX format in a single click and provide an error-free safe data result. 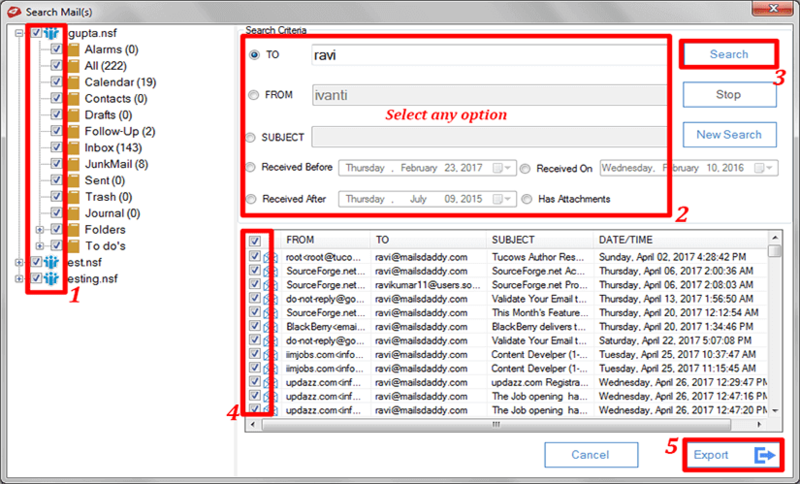 Allow the user to explore the NSF data into various email platforms like Thunderbird, Apple Mail etc. Note: IBM Lotus Notes should be installed & Configured. Check why & How ? 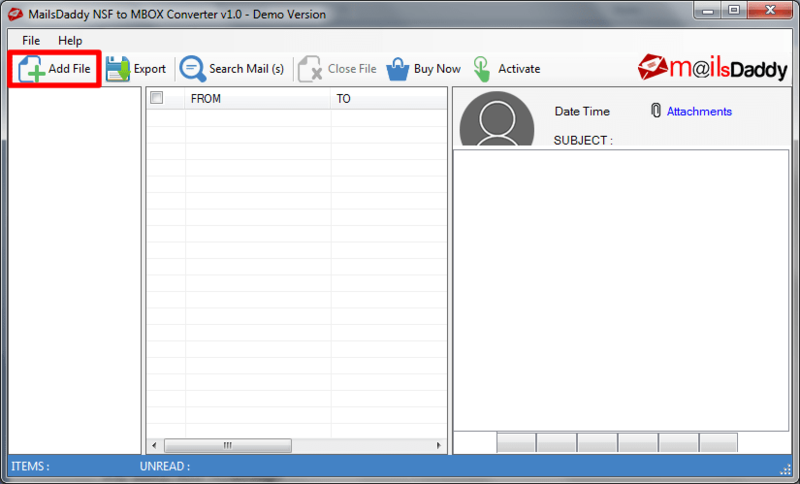 The converter tool is an straightforward solution to export NSF to MBOX format. It is enough to fetch the NSF data from the local directories and migrate Lotus Notes to MBOX. The manual migration process of multiple NSF files is quite tough and time taking approach to convert NSF to MBOX. To get a simple, accurate and speedy result you need to use this tool to export Lotus Notes to MBOX format. If you have a large NSF file and want to convert the selected NSF data than through this NSF to MBOX converter tool you will able to export the bunch IBM Notes NSF files in MBOX format and open that MBOX file in other email platforms like Thunderbird, Eudora, Webmail, Apple Mail etc. Domino Lotus Notes creates a by default “All Folder” in Lotus Notes NSF file which stores all the data in a folder and consume more space and time to convert it in MBOX format. 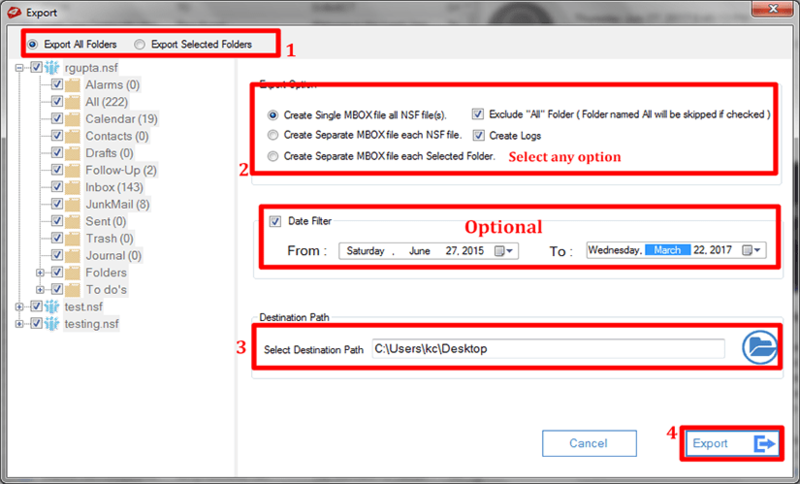 The tool provides an exclude “All” Folder option to save the Lotus Notes to MBOX conversion process timing. If you want that folder then you need to uncheck the “All” Folder option. The tool keeps all the original HTML formatting, Metadata properties like To, from, attachments, subjects, header, footer information, of IBM Notes file in MBOX file after the conversion from Lotus Notes. There is no need to download & install the MS outlook in local machine to convert NSF to MBOX & the migration solution is compatible with all the Windows Operating System (32-bit & 64-bit) as well as supports all the edition of Lotus Notes. It is used to search the specific person or organization email to migrate it in MBOX format and export that data from Lotus Notes to Thunderbird, Lotus Notes to Apple Mail or other various email platforms. It is an advanced option provided in the tool of “Date Range Filter” which will help you to fetch only required NSF email stored within a specific date range from a large NSF file and convert Lotus Notes to Entourage MBOX format or other email platforms. The NSF to MBOX Migration software preserves the same folder hierarchy of Domino Lotus Notes data into the MBOX after the conversion of IBM notes into MBOX format. 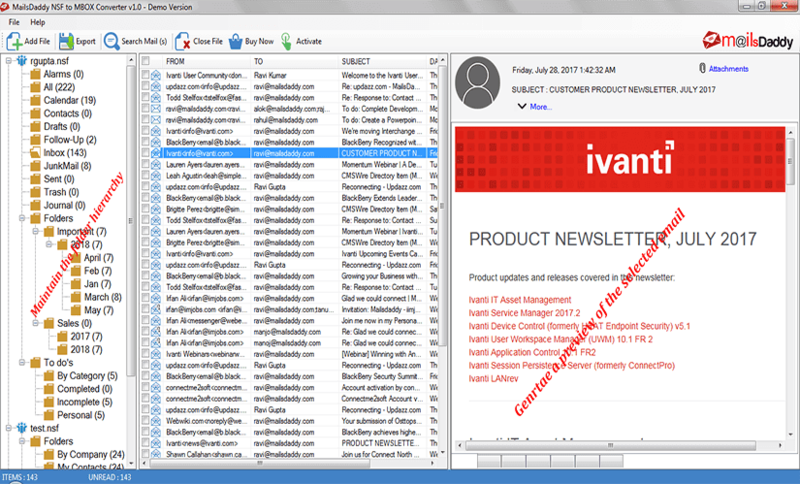 The Lotus Notes to MBOX converter tool supports inline images, Doclinks, data integrity and also preserve them after the conversion of IBM Notes to Thunderbird MBOX. This is the best, simple & smart tool I have ever used. The tool helped me to export Lotus Notes to Apple Mail within a few click & small time interval. Thank you for this remarkable solution. You guys are tendering the best solution for NSF to MBOX conversion. For me using this tool there was no interruption in conversion & I am not regretting to purchase it also I will suggest it to others. Being a tyro user still I am happy to use this admirable Lotus Notes to MBOX converter tool because of its simple GUI and smart features it was easy to operate. I exported my NSF data in MBOX very easily. NSF to MBOX Converter tool export Lotus Notes data in MBOX format at once in few clicks and provides a accurate and 100% safe migration result.